As the first wave of free agency comes to a close, we’ve seen seismic shifts across the league that have sent star players to teams that we’d never have imagined them suiting up for. As is always the case with the free agency period; some units got stronger while others got weaker, and the moves made over the last week will have a profound impact on each team’s draft strategy. With April fast approaching, each franchise will now be looking towards their big board with the goal of winning the NFL draft, but some teams, especially after the last week, will now realize that they need to win the draft in order to save their 2019 season. A week into the free agency period, we’ve recognized five teams that won free agency, we’ve identified five players that can break out with their new teams, and we’ve talked about the five most improved offensive lines. Below is a list of five NFL teams who now need to win the 2019 NFL Draft after free agency. The Arizona Cardinals are on the clock, and they have been since December 30th, 2018. Of course, this isn’t unusual for a team that finished a season with the worst record in the NFL, but what is unusual is the position they now find themselves in. 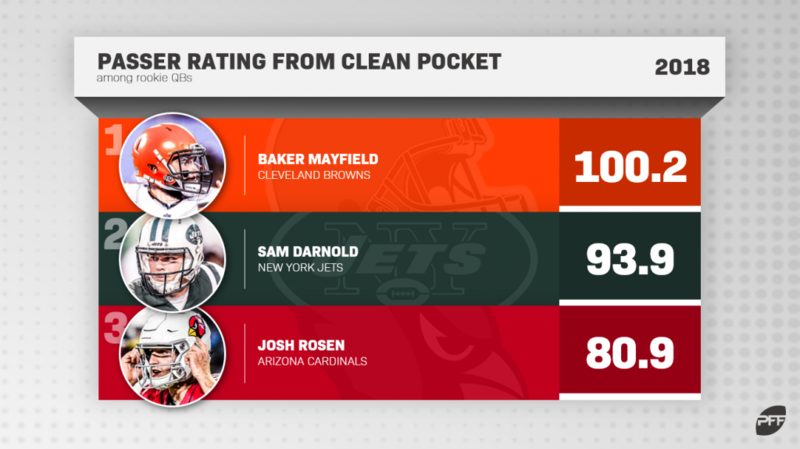 After taking former UCLA signal-caller Josh Rosen with the 10th overall pick of the draft just a year ago, the Cardinals struggled through a year of poor quarterback play by the rookie, who ended the year with an abysmal grade of 49.1 that ranked 37th among 38 players at the position. So, with the added pressure of trying to evaluate and choose who the best player is to select at first overall, they now also have to think long and hard about whether or not they want to ‘give up’ on Rosen and spend their first overall pick on quarterback Kyler Murray, the best quarterback in this year’s draft and a player that would bring a uniquely complimentary skill set to the team’s new look offense. As Senior Analyst Mike Renner said earlier this month: “I don’t care what team you are, if you are in a position to upgrade the quarterback position – with how valuable even slight incremental differences can be – you do it.” However, this is a lot easier said than done, especially if you’re a member of a Cardinals’ front office that traded up to take Rosen in the first place. The Cardinals now have the rare opportunity to pick first overall and take the very best player available. We’re confident that the best player available is Kyler Murray, and we think he can transform the Cardinals’ offense. But do the Cardinals believe the same? And what if they stick with Rosen and he continues to underwhelm under center? What if Rosen shows improvement, but Kyler Murray storms out of the gate and surpasses Rosen in his first season? These are all questions that the Cardinals need to answer in the next month, and after a dismal 3-13 season, they need to be answered correctly. Almost a year ago, New York Giants general manager Dave Gettleman scoffed at the analytical consensus that taking Saquon Barkley, a running back, over a Sam Darnold probably wasn’t the right play in the long run. Barkley then went on to carry the Giants from a 3-13 2017 season all the way to a 5-11 record in 2018, all while being worth about 1.38 wins above replacement – 26th among all non-quarterbacks in the NFL. That’s not to say that Barkley wasn’t great in his rookie season, because he was, his overall grade of 85.9 ranked third among all players at the position by season’s end, and his 872 rushing yards after contact were the fourth-most by a rookie running back in the PFF era. The problem is that a running back can only do so much for a team, and taking a quarterback like Darnold, who was the league’s highest-graded quarterback over the last month of the season, would have gone a long way in securing the future of the now-in-turmoil Giants. Fast forward a year, and Gettleman now has the chance at a re-do, but there’s now even more added pressure on him to replace the talent on a roster that will now be missing star players like Landon Collins, Olivier Vernon, and Odell Beckham Jr. for the 2019 season. It starts with the quarterback position. While Eli Manning is a franchise hero, he’s no longer a viable starter at the position; he’s failed to grade above 70.0 in each of the last four seasons, and his 94 turnover-worthy plays over the previous four years are eight more than the next closest quarterback in that span. The Giants will have the chance to take one at six, and they then need to address the very many holes in their roster with their other 11 picks of the draft. The team has made plenty of questionable decisions recently, and they need to start correcting that come draft day. The Denver Broncos had a solid enough free agency period. John Elway secured the signatures of free-agent cornerbacks Kareem Jackson and Bryce Callahan, which has the potential to re-ignite the fabled No Fly Zone of recent years, while he also signed Ju’Wuan James to a deal to shore up a position that they’ve struggled with for a considerable amount of time. However, their free agency run was far from lossless, and while James’ signing goes a long way in securing the right tackle position, the losses of Matt Paradis (79.0 overall grade in 2018), Max Garcia (50.5), and Billy Turner (62.8) will open up huge holes on the interior of an offensive line that struggled last year, even when they were at full strength. 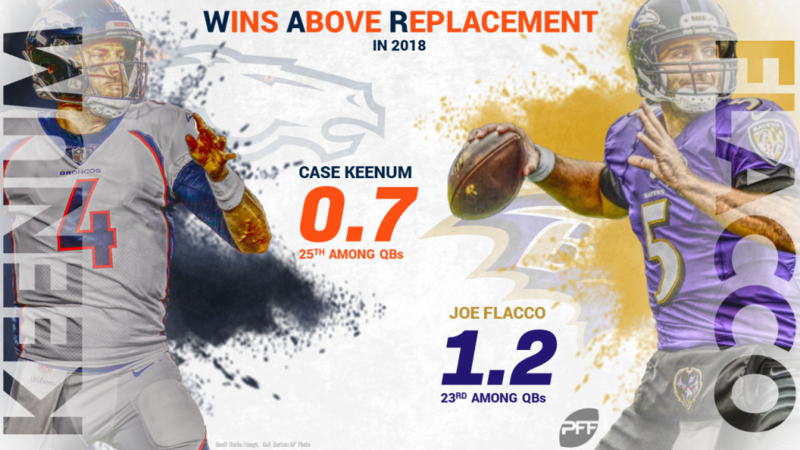 In addition to holes at offensive line, linebacker, and defensive interior, Elway will also have to address the quarterback position, as Joe Flacco is clearly not the answer to a quarterback problem; in fact, he’s barely an upgrade from 2018 Case Keenum. Elway can only patch the most important position in team sports for so long, so quarterback simply has to be addressed in April’s draft – the sooner, the better. The Oakland Raiders find themselves on this list not because they ‘lost’ free agency, as they featured on our list of teams that ‘won’ free agency by way of adding superstar receiver Antonio Brown, left tackle Trent Brown and wideout Tyrell Williams. Rather, they find themselves on this list because they will enter the 2019 NFL Draft with an arsenal of picks that include three first-rounders, so a good draft has the potential to catapult them into the conversation for having one of the best rosters in the AFC. It’s imperative that they use their stockade of picks wisely though, and not squander any picks as they did last year by picking left tackle Kolton Miller, who tested as a great athlete but was not worthy of a first-round selection and consequently ended his rookie year with a whopping 65 total pressures allowed, including a league-high 16 sacks, next to his name. Instead, the Raiders would be wise to add heat to their pass rush, which was substantially depleted in the wake of the Khalil Mack trade. Oakland finished with a league-low team pass-rushing grade of 53.0 last year. The Raiders have a new-look offense, an improving defense and are seemingly only a couple of pieces away from making noise in the AFC – if they win the draft, the league better watch out. The Jacksonville Jaguars are seemingly in the wake of a mass exodus. Over the last week, the team has lost several starters, including quarterback Blake Bortles (64.1 overall grade in 2018), interior defender Malik Jackson (64.4), safety Tashaun Gipson (70.7), right tackle Jermey Parnell (65.3), running back Carlos Hyde (52.8) and tight end Austin Seferian-Jenkins (69.6). While the quarterback position has been ‘addressed’ by signing Super Bowl LII MVP Nick Foles to a four-year $88 million deal, other spots need to be filled before the kickoff to the 2019 season, especially wide receiver, tight end, and offensive line. As we saw from the 2018 campaign, the unstable nature of defensive play means that teams can no longer rely on strong defense to win championships, and while the defensive unit may well return to dominant form next year, that simply won’t matter if the Jaguars don’t surround Foles with the talent that he needs in order to succeed.